1. In the periodic table, the highly electronegative halogens and the highly electropositive alkali metals are separated by the noble gases. Therefore one or small number of electrons are easily gained and transferred to attain the stable noble gas configuration. 2. The formation of a negative ion from a halogen atom and a positive ion from an alkali metal atom is associated with the gain and loss of an electron by the respective atoms. 3. The negative and positive ions so formed attains stable noble gas electronic configurations. The noble gases (with the exception of helium which has two electrons in the outermost shell) have filled outer shell electronic configuration of eight electrons (octet of electrons) with a general representation ns2 np6. 4. The negative and positive ions are bonded and stabilised by force of electrostatic attraction. Kossel's postulates provide the basis for the modern concepts on electron transfer between atoms which results in ionic or electrovalent bonding. NaCl is an electrovalent or ionic compound made up of sodium ions and chloride ions. The bonding in NaCl is termed as electrovalent or ionic bonding. Sodium atom loses an electron to attain Neon configuration and also attains a positive charge. Chlorine atom receives the electron to attain the Argon configuration and also becomes a negatively charged ion. The coulombic or electrostatic attraction between Na+ and Cl- ions result in NaCl formation. Similarly formation of MgO may be shown to occur by the transfer of two electrons. The bonding in MgO is also electrovalent or ionic and the electrostatic forces of attraction binds Mg2+ ions with O2- ions. Thus, "the binding forces existing as a result of electrostatic attraction between the positive and negative ions", is termed as electrovalent or ionic bond. The electrovalency is considered as equal to the number of charges on an ion. Thus magnesium has positive electrovalency of two while chlorine has negative electrovalency of one. The valence electron transfer theory could not explain the bonding in molecules like H2, O2, Cl2 etc., and in other organic molecules that have ions. G.N.Lewis, proposed the octet rule to explain the valence electron sharing between atoms that resulted in a bonding type with the atoms attaining noble gas electronic configuration. The statement is : "a bond is formed between two atoms by mutual sharing of pairs of electrons to attain a stable outer-octet of electrons for each atom involved in bonding". 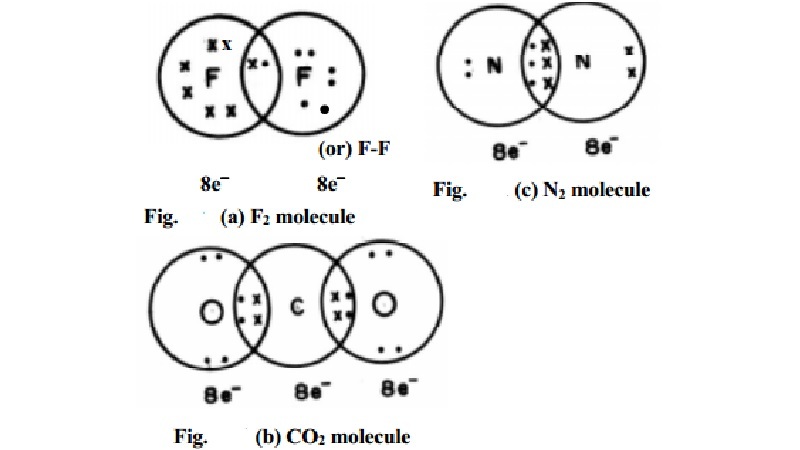 This type of valence electron sharing between atoms is termed as covalent bonding. Generally homonuclear diatomics possess covalent bonds. It is assumed that the atom consists of a `Kernel' which is made up of a nucleus plus the inner shell electrons. The Kernel is enveloped by the outer shells that could accommodate a maximum of eight electrons. The eight outershell electrons are termed as octet of electrons and represents a stable electronic configuration. Atoms achieve the stable outer octet when they are involved in chemical bonding. contributes one electron to the shared pair of the bond of the F2 molecule. In this process, both the fluorine atoms attain the outershell octet of a noble gas (Argon) (Fig. (a)). Dots (�) represent electrons. Such structures are called as Lewis dot structures. 1. Each bond is the result of sharing of an electron pair between the atoms comprising the bond. 2. Each combining atom contributes one electron to the shared pair. 3. The combining atoms attain the outer filled shells of the noble gas configuration. If the two atoms share a pair of electrons, a single bond is said to be formed and if two pairs of electrons are shared a double bond is said to be formed etc. All the bonds formed from sharing of electrons are called as covalent bonds. In carbon dioxide (CO2) two double bonds are seen at the centre carbon atom which is linked to each oxygen atom by a double bond. The carbon and the two oxygen atoms attain the Neon electronic configuration. When the two combining atoms share three electron pairs as in N2 molecule, a triple bond is said to be formed. Each of the Nitrogen atom shares 3 pairs of electrons to attain neon gas electronic configuration.